Lysterfield Lake done and dusted! In the final event of the Kathmandu Adventure Series for 2014, Lysterfield Lake sure turned on the heat with temperatures reaching a scorching 34 degrees C! While this affected some teams the wind perhaps played more of a role, adding to the challenge and thrill of the kayak legs. This did not slow down the teams with Male team AdventureJunkie.com.au (Serge Kurov and Gary Freudigmann) clearing the course in a sizzling 2hrs 30min. Their nearest rivals were over 13min behind! 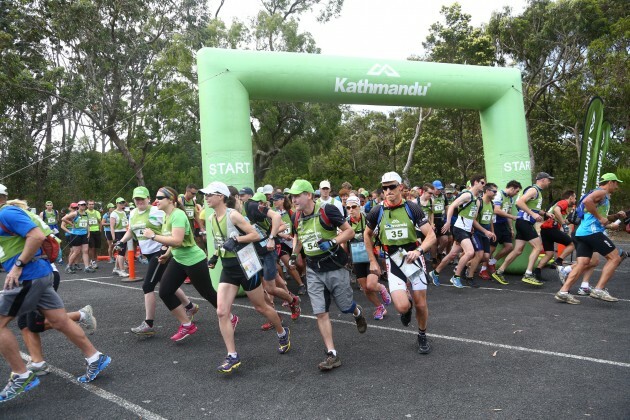 First Mixed team over the line was CP Seekers (Blair and Lisa Brydon) in 2hrs 49min and rounding out the winners list was the all Female Team Hammond (Sarah Hammond and Kelly Bayliss) in a cool 3hrs 33min. While AdventureJunkie.com.au ended up clear winners they had a real fight on their hands early as the other podium winners French Connexion and Sonic & Knuckles pushed hard. In the end the experience of AdventureJunkie.com.au showed with super slick transitions consistently pulling them away from their competitors. Sonic & Knuckles were thwarted by some bike issues and were left wondering what could have been. In the Premier Mixed Category the winners CP Seekers were the class of the field, staying with the Male teams all the way. No Kids Today and M & M’s had a ding dong battle for 2nd, swapping positions numerous times, until No Kids Today secured 2nd place late on. Team Hammond took out the Female category from Fire Runner and We Can’t Navigate who were obviously downplaying their skills with a map and compass. While these teams took out the sweet prizes on offer from Kathmandu the rest of the field certainly didn’t miss out with teams coming back beaming with tales of flowing single track goodness, charging downwind kayaking, navigation that kept everyone on their toes and the usual fun & frenetic action as teams were constantly swapping between disciplines. Lysterfield Lake has a real reputation as a outdoor playground for the young and the young at heart and when it puts on a show like on Saturday it is easy to see why!